Free weights are an effective way to tone and strengthen the muscles in your arms, back, chest and shoulders. Make sure you use proper technique though. Jessica Matthews, a certified trainer with the American Council of Exercise says, "Not only will this save you from injury, but will optimize the results as well." It’s also important to warm up by doing some light cardio and stretching before jumping right into lifting weights. Both lateral and front raises target the deltoid muscles of the upper arm. For a lateral raise, grip a dumbbell in each hand and hold your arms by your sides. Lift the weights out to the sides to shoulder height and slowly back down. A variation of the lateral is the front raise, done with either dumbbells or a barbell and executed by extending your arms out in front of you, lifting them to shoulder height and back down again. This exercise targets the arms, chest and shoulders -- exercising the deltoids, triceps and pectoral muscles. Use your workout buddy or ask someone at the gym to spot you while you do this exercise. Lie down on a weight bench on your back with your feet either on the floor or on a raised platform to keep your spine neutral. Grasp the barbell with your palms facing upward and shoulder-width apart. Push the weight up, extending your elbows without locking them. Inhale and slowly lower the barbell to your chest. Exhale and repeat. Maintain a neutral wrist movement. Your spotter should keep his hands close enough to the barbell that he can grab it if you become fatigued. This exercise works out the latissimus dorsi -- also known as lats -- as well as the rhomboids, biceps and trapezius of the arms and upper body. Use a sturdy chair or a weight bench for this exercise. Place your left hand, palm down, on the chair with your knees slightly bent. Grasp a dumbbell with your right hand and extend your arm to the floor. Keep the upper body almost parallel to the floor and look toward the bench to keep your neck aligned. Draw your belly button into the spine and lift up the dumbbell until your arm forms a 90-degree angle at the top of the motion. Slowly lower the dumbbell back down and repeat. Target your biceps as well as the brachialis and brachioradialis muscles with these curl exercises. Extend your arms in front of you with a dumbbell in each hand. With your palms facing up, curl the weights towards the shoulders in an even, controlled motion. A variation of this exercise is the extended biceps curl. Sit on a bench with a back rest and, with a free weight in each hand, lower your arms toward the floor and then lift the weights slowly toward your biceps. For both exercises, be careful not to jerk the weights up in rapid pulses as this can lead to strain and/or injury. Complete two sets of 10 to 15 repetitions each. Squats build muscles in the legs, including the quadriceps, calves, hamstrings and hip flexors. Use free weights while performing squats to maximize the effect. Start by holding a dumbbell in each hand. Position your legs shoulder-width apart and slowly bend your knees, keeping your upper body straight. Push your buttocks out as if you are sitting in a chair, but do not lower yourself so far down that you become unbalanced. Return to a standing position and do eight to 12 repetitions in each set. 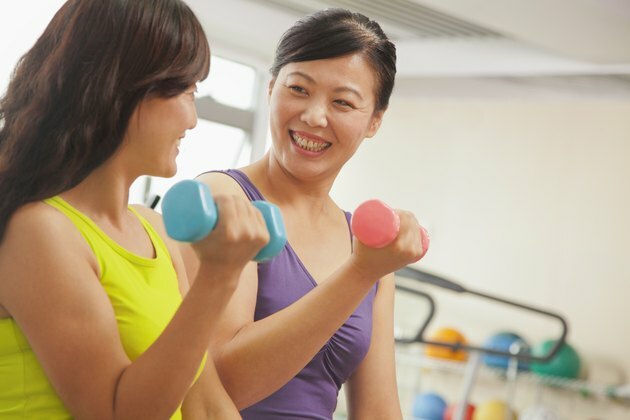 As with the other free weight routines, three sets of eight to 10 repetitions is a good start for beginners; being careful not to lift so much weight that motion is jerky or uncontrolled. Sarah Richards of Fitness Magazine suggests that beginners start with three- to five- or eight- to 12-pound weights and focus on two sets of 10 to 15 reps each. ACE Fitness: When Strength Training Is It Better To Use Machines Or Free Weights?